So this is a rude awakening for Fortnite (Free) fans looking to play with their account on Switch: if you’ve linked to the PS4 version of Fortnite before, you can’t use your account on the Switch version. 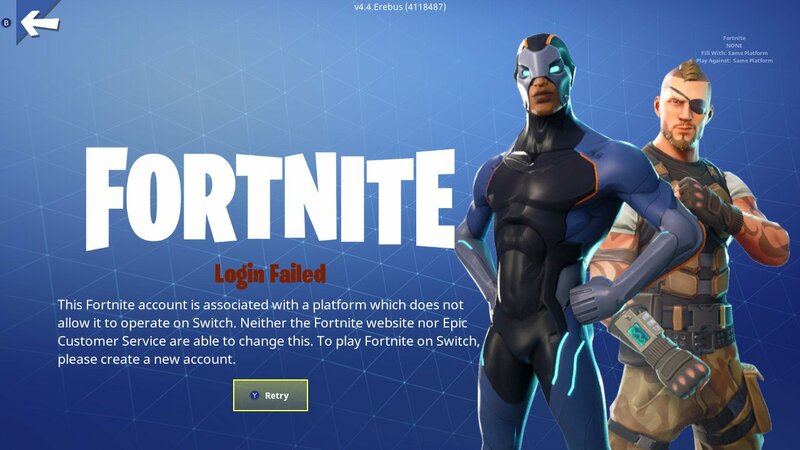 Fortnite on Switch will throw you an error message saying that your data is locked to another platform. with the Epic account via email and password. Epic’s support page indicates that unlinking an account won’t circumvent a Platform Lock, unfortunately. This means that you don’t have your purchases and Battle Pass on the Switch version if you made the mistake of ever deciding to play the PS4 version. This is rough, because a decision you might have made at one point in the past, not knowing it would affect you in the future, is now requiring you to double-dip on purchases. While the game is perfectly playable without consumables, the Battle Pass in particular provides special gameplay objectives and exclusive cosmetics. Blame for this seems to fall on Sony, who has been a stick in the mud with cross-platform play. The Switch and Xbox One versions can play with one another, and your progress carries across platforms with those versions. Sony doesn’t allow playing with the other consoles where Nintendo and Microsoft have been okay with online games talking to each other, and it is a similar situation with Rocket League. It seems draconian, though, that even if you disconnect from PSN, it won’t unlock your Epic account to login on the Switch or Xbox versions, even if it was a one-time, “you can’t go back" move. Or, Sony needs to stop acting like a petulant child and give people the freedom they deserve with their accounts. Because this sure doesn’t make me want to play Fortnite on PS4, or any Sony game, going forward, if they are so opposed to consumer freedom. It’s a shame because it puts a damper on Fortnite on Switch, which is otherwise a solid port, minus the absence of motion controls. You can create a new account or play as a guest, so if you don’t have that John Wick skin, might as well create a new username slagging Sony for their draconian policies…or hold out hope that public shame might get them to change their mind.